1. Want a free KACO? Go to a pen show. 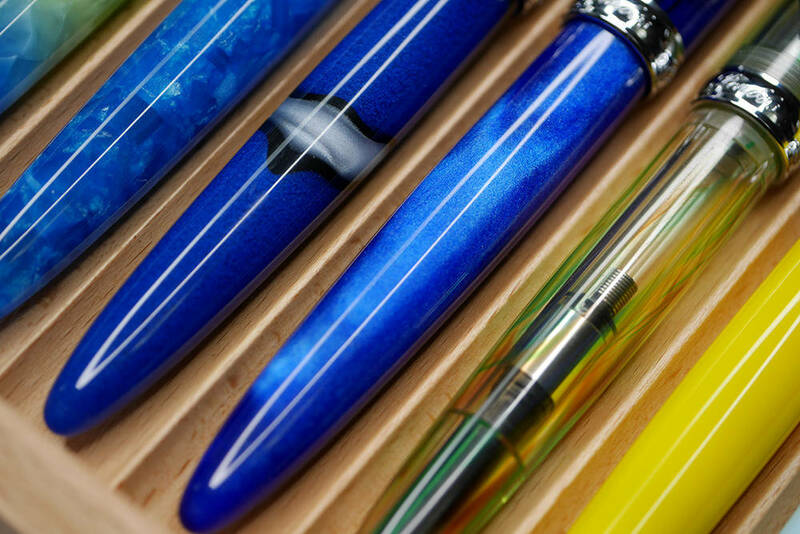 The award-winning and well-made KACO fountain pens have been featured in the past two issues of the Pen World Magazine, while it is still impossible to buy one from US resellers up to this point. However, from this past Philly Pen Show, I have learned that you can grab one of the SKY (or even SKY II) pens at the booth of the Pen World Magazine during a pen show with your magazine subscription updated there. This partnership has existed ever since last year’s Ohio show, where the KACO pens first debuted. It is unclear how many pens remain in the magazine’s warehouse, but it is clear to me that everybody who tried this entry level KACO pen loves it during the show. I picked up one of the new SKY II myself yesterday, and I am already impressed. Review on the way. When people were surprised by the seamless collaboration between a Jowo feed and a vintage Chinese nib on its Aspirin model, the Moonman brand delivered its third product: the Moonman 80, pricing at $7.6 with 3 (or 9) variants. The Moonman 80 is a remake of Hero 800, or Parker 45, without a doubt. 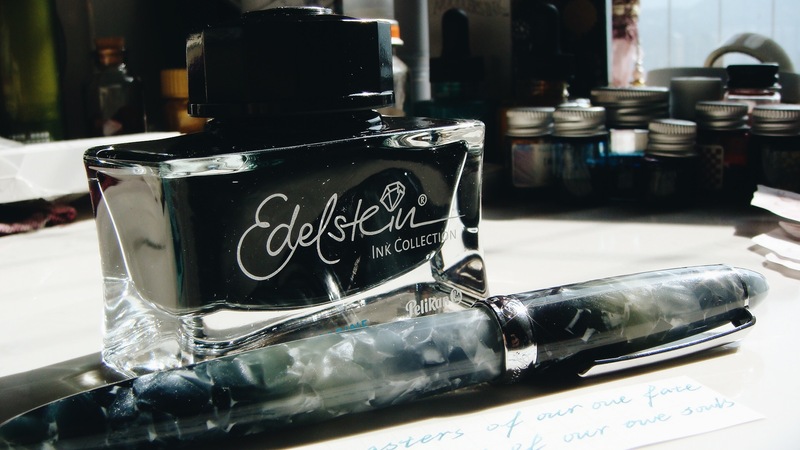 Not only does it look similar to the classic semi-hooded models, customers of the Moonman found that the nib unit is interchangeable with a HERO 800. Though currently there is only stainless steel available for purchase. However, the company did try to twist the design. The color pallet consists a black, a mustard and a teal color, which gives the model a touch of old time. The steel cap is also enhanced by three different styles of engraving: a highly brushed one, a diamond one, and a lined one. You can pick up the cap design for your preferable body upon purchase, which means there would be 9 variants for the Moonman 80. I didn’t mention Tang Fountain Pen (棠钢笔) before due to the limited production quantity of its products. But judging from what it launched at the end of last year, I am eager to introduce this brand to my readers. Almost all the Tang FP’s offerings share the same basic design: a cylinder shape of pen body with a long sleeve that extends across the pen and functions as either a thick barrel or part of the cap depends on the way you use it. A #5 Schmidt or Online steel nib unit performs the writing part. The Tang FP usually updates its catalog with a new type of acrylic each time when the previous one is sold out. A sleek aluminum version is the newest results of such rollouts.Tang FP’s design only speaks when you see the pictures of its pen in use. Its setup is enabling two different handling experience in one pen. Uncannily smart! …or you can remove the first layer of the barrel to have a thinner pen. The long-waiting modern vacumatic made by Green Wing Sung faced some serious design defects and quality issues when it was launched one day after the Christmas. Customers, with high expectation, found that their pens were haunted by issues as cracking edges, misalignment of the blind cap, stained barrel, or a vacumatic system that leaked. Before the New Year’s Eve, I reached out for the owner of the Green Stationery Mr. Zhang, and he told me it was a tragedy since his team underestimated the level of precision and management needed to reproduce a vacumatic. He told me the company was working overtime to deal with these quality issues.Now the Wing Sung 601 line has been updated with improved design and QC methods. Time will tell whether these measures work. Above: a series of close-up shots of the newest batch of Wing Sung 601. A video originally posted by one of the business partners of the brand showed that the upcoming vacumatic demonstrator from the Penbbs may be using a filling system similar to the one used in an Edison Draw Filler. From the same source, the bi-color nibs from the Penbbs label were revealed. They look awesome. However, both this model and the plunger filler have not yet been launched. And there is no exact information about when will the bi-color nibs be available. 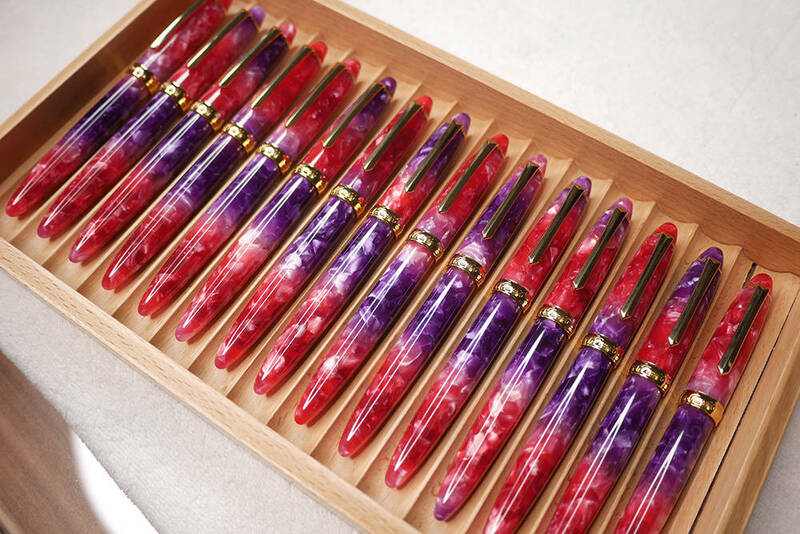 But there was indeed some amazing new pens hit the market during the past month, i.e., the model 308 with rose gold trim and breathtaking acrylic pattern. During my undergraduate study at Amoy University, I slowly realized that across the Taiwan Strait, there was a pen brand gaining more and more momentum, and that is TWSBI. According to the official Weibo account of TWSBI in late Dec., the company has set up a new factory in mainland China. Two mainland-exclusive ECO models were announced at the same time to greet 2018. For years, TWSBI has been running a subsidiary inside China producing parts and handling legal issues. The company, Suzhou TWSBI Pen Co., is located in Zhangjiagang City, an industrial powerhouse of Jiangsu Province. While the TWSBI didn’t point out the exact location of the new factory, my best guess is that the company actually upgraded the capability of the Suzhou factory in answer to the growing demand from the mainland market. Nonetheless, this reflexes a very interesting shift of the stationery consumers inside China since the steel-nib TWSBI was once the synonym for paying too much for less there. Maybe this also implies that one day we may have a new TWSBI with a made in China tag. The Shanghai Hero Pen Factory has been teasing pen collectors in China for seasons about the upgrade of its all-time classic, the Type 100 fountain pen that remains mostly unchanged for 40 years. In Jan 20th, without preliminary announcement, two major retailers of HERO-100s released at least two special-colored variants of the updated versions. In previous interactions with fans, the company claimed that these pens would get better material and QC measures, avoiding issues such as nib-wobbling or misalignment of parts, but most importantly, this time we saw two of the retired colors got resurrected. In Chinese spelling, one of these colors is called Lake Blue(turquoise), the other is Rice Grey(beige). They are all new productions from the HERO’s factory in Shanghai and asking for ¥258 (roughly $40.36) on Taobao, the same price as their black or burgundy counterparts. Previously, these two colors fell in the rare category of HERO-100 pens, and resellers could quickly sell them charging a premium (above $150). There is no information from the retailers about whether the black, burgundy and Flighter variants have also got the supposed upgrade. Currently, the inventory of these two models is running out fast. As for the international purchase, so far I haven’t spotted any resellers from eBay or Aliexpress stocking this version. But if you got the chance to access one of them, be aware that the surface of the plastics may have swirl pattern shaped during the molding process, according to the retailers. Update Jan 22nd 3AM ET: The Hero-100 section was added. Hi Luis: Wow, I am flattered! Not a single day of mine could pass without peeking into my homeland pen market, they are really catching up in design. Hope the custom didn’t charge you too much! Very cool, interested in buying a tang. Where can they be purchased? Personally I would pick the red AL one featured in the title picture. Hi Frank. Do you have a link for the Sky II? Cant seem to find it. The major difference is the finish of the barrel and the nib. Oh. Thought there was a new one. This is the “Makrolon” version if I remember correctly. Sad they don’t have broader nibs. I just got 2 601 – published video. They are OK so far. Well made. Write like a vintage 51. I just found your blog last night. Wow! This is awesome! A wealth of information. I am completely excited and ready to learn. Thank you so so much for this! Looks like my ebay account is going to have a shopoing cart filled with Chinese pens this month! Whoohoo! Cassie, Thanks again! There are some words and business games going on there for some of these brands, thus it could get quite confusing even for a Chinese pen buyer. I am glad you like this format of news delivery, and please don’t hesitate to share your buying experience with us!